Set up in the triangle set as seen in Diagram 1. O2 screens for O3, and O3 cuts to the corner. 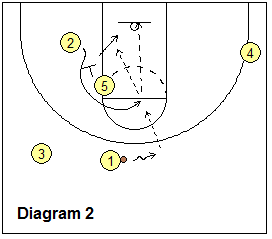 O5 down-screens for our shooter O2, and O2 cuts to the top for a possible pass and 3-point shot. If the defenders switch the O5 down-screen, O5 might have a size mis-match. After screening, O5 seals the defender and looks for the inbounds pass and lay-up. This sideline out-of-bounds play uses a basic box formation (diagram A). The play starts with post players O4 and O5 setting down-screens for O2 and O3. O2 and O3 cut off the screens to the 3-point area. The in-bounds pass goes to O3, while O2 serves as a safety and also stays back on defense. After O3 receives the ball, O5 back-screens for O1 (diagram B). O1 cuts hard off O5's screen (on the baseline side) and goes to the hoop. O3 makes the pass back to O1 for the lay-up (diagram C). A second option would be the pass to O5, who seals and rolls off the back-screen to the hoop. If the pass is well-defended, O3 passes instead out to the point to O2, and O1 goes through and fills the opposite wing, and you are in your half-court 3-out, 2-in offensive set. Contributed by Tracy Fontenot, girls' coach, Sacred Heart High School, Ville Platte, La. 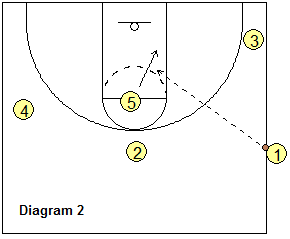 This play has slight variations depending on whether you are against man-to-man, or a zone. Here is our basic setup: O2 is our "shooter". O5 our best rebounder. O4 our best post player. (Diagram A) O2 screens down for O1, and then uses the staggered screen set by O5 and O4 (screen the screener). We want to get the ball to O2, our shooter, either a direct pass from O3 or from O1. O2 is looking for the shot or to pass to O4 posting up (with O5 in rebounding position). Or once O2 gets the ball, you can have O5 flash high and clear out for the lob to O4, or use the hi-low option. (Diagram B) #2 screens down the same way for O1. O1 must come to the ball (want to draw the play-side guard (G) up to clear wing area). O2 then curls under to wing area using O4 screen on the forward (F). We use the same options from there. (Diagram C) We have used this option against the zone and have been successful also (especially when scouted on the 1st option). O2 screens down the same way for O1. O1 must come up to the free throw line, and then follows O2 on the baseline. O2 basically clears out the baseline for O1. This play tries to get O2 open for a 3-point shot or a "take" to the hoop. O2 curl cuts around the O4 and O5 double-screen to the opposite wing. 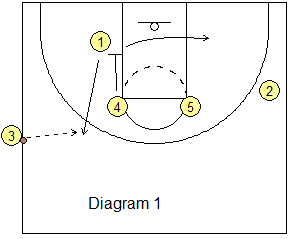 O1 follows O2 around the double-screen and we want O1 to get open to receive the in-bounds pass from O3. After passing, O3 goes to the ball-side corner. Once O1 receives the pass, O5 and O4 quickly sprint over and set a double, staggered screen for O2. O2 comes around the screens for the pass from O1 and the possible 3-point shot, or a dribble move into the lane (diagram B). If the defense switches the staggered screens, O5 can "slip" the screen and cut inside for the pass from O1 (diagram C). O1 could also look to O3 in the corner. The pairs are O1 and O5, and O2 and O4. O4 screens for O2 and O2 comes over the top of the screen (especially if the ball is near half-court). If the ball is being in-bounded partway up the sideline, then O2 might cut below the screen (baseline). O3 looks to O2 for the first option. If open, O2 could shoot the 3-point shot, or shot-fake and shoot the jumper. Or O2 could pass inside to O4 posting up - often a mis-match if the defense switched a "big for a little". O5 screens for O1 and O1 is our safety pass if O2 is not open. O5 could even be open for the pass inbounds. Submitted by Coach Ken Sartini, Arlington Hts, IL. This play uses the stack formation again. 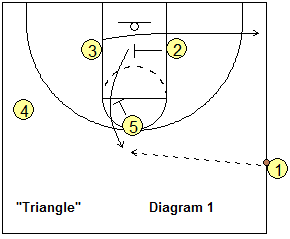 Coach Sar originally ran this play from half-court or beyond (back-court), but it can also be run from the fore-court sideline as the diagrams below show. Very importantly, the stack must be in a line with the lane line extended, and O1 must be directly across from the inbounder O3. If the stack is too close to the sideline, there will not be enough spacing to run the play. O1 screens for O2, and then replaces that spot, making himself available for an inbounds pass if necessary. O2 fakes a V-cut, and then cuts around the screen from O1, and runs the near sideline looking for the inbounds pass, and possible dribble to the hoop (a great option if there is no a safety defender). If O2 does not receive the pass, he/she moves to the ball-side corner. O5 takes a few steps away and then back-screens for O4. After the screen, O5 might have to come to the ball if the defense covers all the other options. 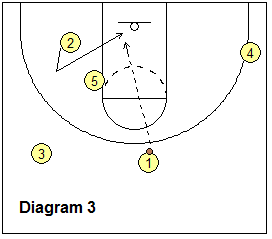 O4 takes a step to the ball and then cuts around O5's back-screen, running to the opposite side of the floor. An inbounds lob pass to O4 is a second option. If neither O2 or O4 get the pass, O3 should pass into O1 or O5, then just run your usual offense. The timing is such that the first action is by O1 and O2. and as O2 receives the screen, O4 and O5 make their moves. 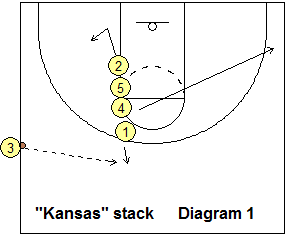 I saw Bill Self's Kansas Jayhawks run both options of this play for two easy baskets. Diagram 1 shows the starting stack formation. O1 pops out for the inbounds pass, and dribbles a little to the right top area. O4 clears to the opposite corner. The first option shows that O2 drops inside and then curls around O5's screen for the pass from O1. O2 could either shoot or pass to O5 rolling to the hoop. The second option works beautifully after scoring on the first option. We run the same play again and the defense is looking for that curl-cut. 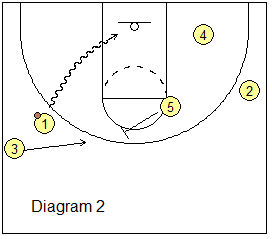 This time O2 fakes the curl-curt and quickly back-cuts to the hoop for the pass from O1 and lay-up or dunk. This is a play that was run by the Boston Celtics. O3 is the inbounder (diagram 1). O4 down-screens for O1. O1 cuts up to the top to get the inbounds pass from O3. Now we have options. O4 posts up and might be able to get a quick pass from O1. If not, O4 moves to the opposite short corner. Diagram 2 shows the next option, a fake hand-off by O1 followed by a dribble-drive to the hoop. Notice that upon receiving the inbounds pass, O1 does not immediately start the dribble, and this allows for this fake hand-off option. The next option is for O1 to hand-off to O3 (diagram 3). 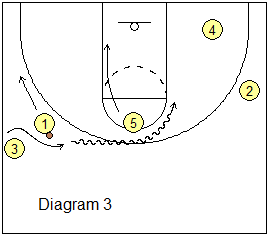 O3 then runs a pick-and-roll (or pick-and-pop) option with O5. O1 clears to the left wing for a possible kick-out pass. Note that the fake hand-off option is more effective after running the play through a time or two, as the defenders will cheat toward the hand-off, allowing O1 to make the dribble-drive. with Austin McBeth, University of Illinois-Springfield Head Assistant Coach.